The family of Quade Gifford filed a lawsuit against Walmart claiming negligence. Jared Compton was convicted of killing Gifford in May 2018. The two worked at a Walmart in Largo. According to the lawsuit, Walmart's human resources department knew about mounting tensions and harassment by Compton. 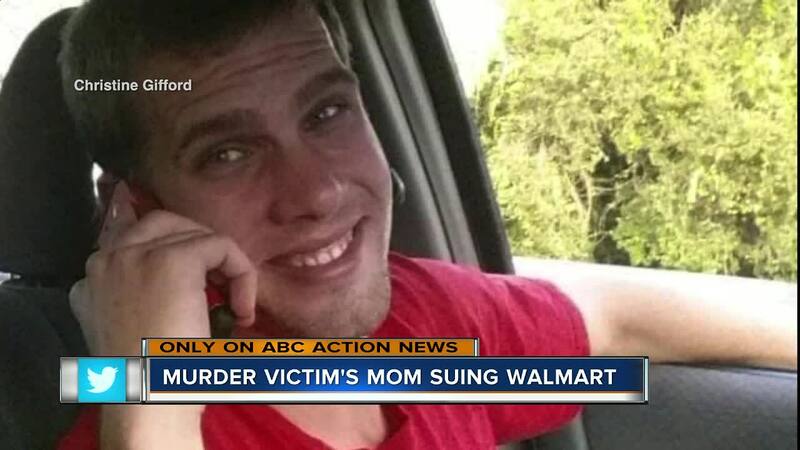 LARGO, FLA.- The mother of Quade Gifford is suing Walmart where her son worked before he was murdered on New Year's Eve in 2016. "It's very challenging, hard trying to find purpose every day to move forward. It's very tough," said Christine Gifford, mother. According to court records, Jared Compton went into Quade Gifford's home with a Halloween mask and a gun to confront Gifford about his involvement with his ex-girlfriend on New Years Eve 2016. Compton was sentenced to life in prison for first degree murder in May 2018. Gifford and Compton both worked at a Walmart in Largo. According to the lawsuit, Gifford started dating Compton's former girlfriend, who was also a Walmart employee. According to the lawsuit, Gifford sought assistance from Walmart's human resources department by reporting mounting tensions and harassment from Compton. Gifford was seeking a transfer to the produce department. "Everybody at that place of employment understood what was happening, understood the dynamic, understood Jared Compton was specifically jealous. He had voiced his jealously. He had expressed his rage," said attorney Jack Gordon. Attorney Jack Gordon said Walmart did not take any action. "Quade sought the assistance of human resources. Unfortunately, he wasn’t provided the assistance," said attorney Jack Gordon. The lawsuit alleges negligence. It also states Compton and Gifford were required to share employee locker space. The lawsuit alleges Compton, who was not working at the time, accessed an employee locker room and duplicated the victim's apartment key and then used it the night the victim was murdered. "He stole that key from the locker. We can see this on surveillance tape. He makes his way to the kiosk where Walmart employees replicated and duplicated that key for him," said Gordon. "At the end of the day, this tragedy was a function of a love triangle. Everybody at that place of employment understood what was happening," said Gordon. Gifford's mother struggles to find any comfort. "Senseless, uncalled for and evil. He didn't deserve to die that way," said Gifford. She said she was close with her son and he loved his family. Gifford was 24-years-old when he was murdered. His mother said he was part of the ROTC program for 3 years in high school. He attended Central High School in Brooksville. "He had a great sense of humor, helpful , always there for his sister and myself, friends and family. He liked to laugh. He loved to make other people laugh, very genuine and a kind person," she added. A Walmart spokesperson said they will review the lawsuit and take these allegations seriously.